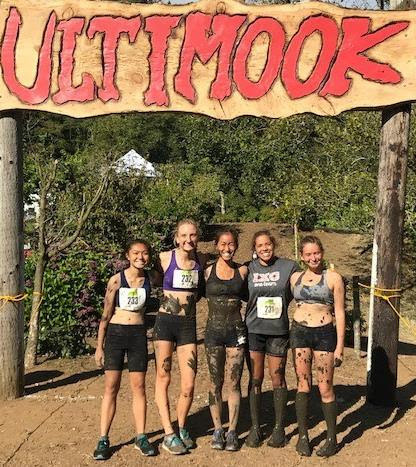 The CP Cross Country Team wanted to run a race on a course that offered a “REAL” cross country experience. 18 athletes took the early morning flight to Portland with Head Coach Miguel Castro and 8 chaperones. They had a full schedule to get through in just a few days. Athletes toured Reed University and ran their practice run at Tualatin Hills Nature Park on Thursday. 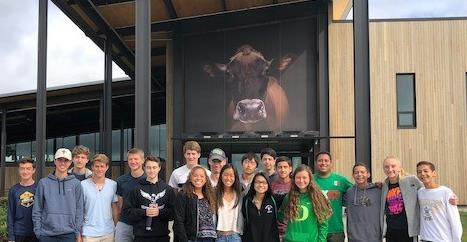 Friday, the group toured the Tillamook Cheese Factory, worked out at Oceanside Beach, ran a trial run through the race course before having a pasta feed at the Hydrangea Ranch. Back at the hotel, athletes and chaperones checked on the weather for race day. Rain in the forecast. Not good considering the difficult aspects of this true “cross country” course. 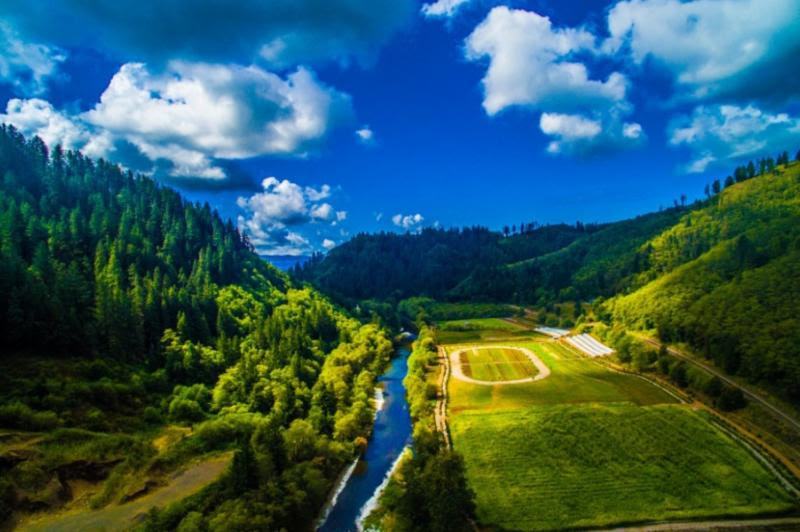 The Ultimook Nike Invitational is a cross country race that is held at the Hydrangea Ranch in Tillamook, Oregon. This famous race course features two river crossings (shallow but nearly waist deep if you’re 5’2″, but with a wide crossing), a mud pit (deep enough for you do dive in), a mile of wood chipped trails, and of course a bunch of beautiful hydrangea flowers all along the course. This was not a course to try to get a Personal Record time. It’s a course where you just hope that you can finish. “I hope I don’t lose my shoes in the mud pit!” was on everyone’s mind. Athletes are DQ’d and removed from the race if they lose a shoe(s) in the mud pit. 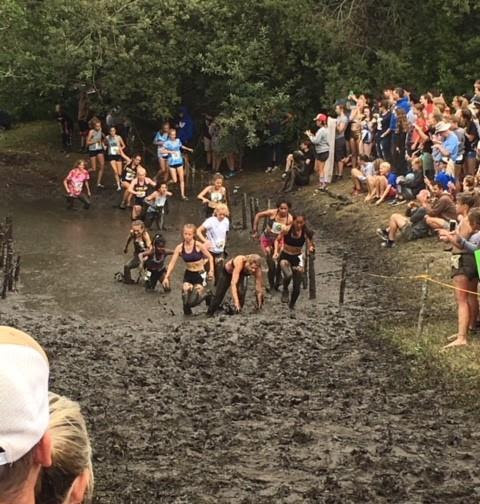 On their trial run of the course, the athletes strategized how to best get through the mud pit but when they inspected the course on race day, the mud pit was wider and fuller. The course director had added more mud! 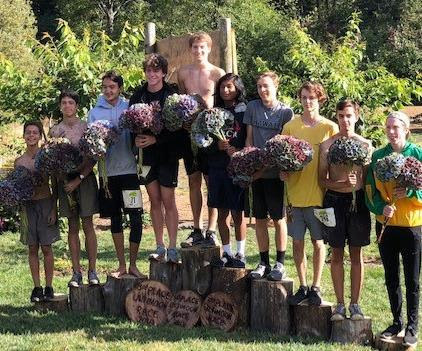 The first squad to race featured the JV Boys with athletes Carson Nagel, Dylan Viale, Joseph Ziegler, Kyle Pickle, Max Benabou, and Nico Ceresa. At 2:45pmthe bell rung (yes, no gun, church bell – that’s how they do it up there in Oregon). The JV boys were off to a great start as they made their way across the wide grassy field. Chaperones stationed at the mud pit waited for the runners to come through. What a hilarious and crazy scene that was! Joseph Ziegler was the first runner to reach the mud pit. Then one by one the JV boys made it out of the mud pit with shoes intact! Whew! From there they headed to the first river crossing. The Kilchis River was shallow but very rocky at this time of the year. The runners had to make their way down a rather steep bank to get to the river and then plash their way through ankle deep water. Then back on the trails before crossing the river again , conquering the hill, running past the hydrangea fields and making it back to the finish line. The JV boys were phenomenal on the course: Joseph Ziegler, after exchanging the lead with an Oregon runner, took back the lead in the final stretches to take first place! He was followed by Carson Nagel in 7th, Dylan Viale in 8th, Max Benabou in 9th, Kyle Pickle in 15th and Nico Ceresa in 111th. In cross country the top 5 runners score for the team. With 40 points the JV Boys took first place in their division winning by 41 points! What happened to the rain that was forecasted? Umbrellas were pulled out and drops of rain came down intermittently and sporadically. Then it stopped right before the Varsity Girls division. 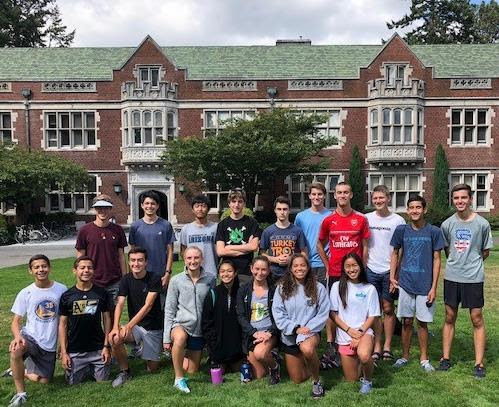 CP XC lost 10 seniors at the June 2018 graduation. With a decimated squad, only 5 girls were invited to race. 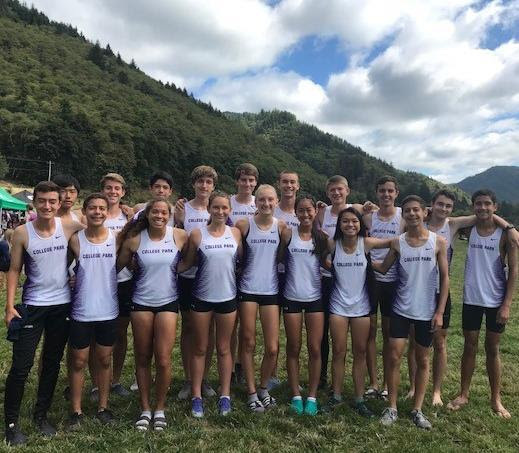 Returning seniors Kylie Tseng and Tayler Hall led their squad in warm ups while the JV boys were racing and then received some final course tips from the JV boys when they finished. Meanwhile, there was some confusion at the start of the race about the bell not ringing because the signal to “go” was given so the girls were told to “go as soon as the signal is given and not wait for the bell!” Luckily, the start was a good one and our girls were out in the front across the newly moistened grassy field. Kylie Tseng was first in the mud pit. She charged through with force in seconds. She was followed by Tayler Hall who scrambled up the slippery mud bank with ease. Freshman Lindsey Reed was not about to let her teammates down as she strongly ran through the mud pit to come in 3rd for her squad. 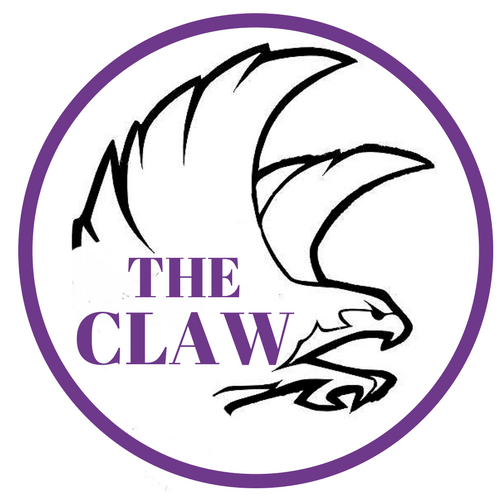 Molly Ostrowski who is used to swimming in chlorinated water looked appalled at the mud on her body hurried through the pit, and finally, Dalena Pham, the petite sophomore waded through the mud delicately. No DQ’s! The girls finished 10th out of 17 teams. Kylie Tseng came in 17th out of 140 runners with Tayler Hall finishing in 44th, Lindsey Reed in 49th, Molly Ostrowski in 55th and Dalena Pham in 118. The Varsity Boys race was the finale! By 4:00pm, the sun was behind some clouds and a chill was in the air. Again, the bell rung and the boys were off to a great start. Dylan Cook was the first to reach the mud pit. To avoid the crowd of boys on the left he went in to the pit on the right side. The thicker mud made it more difficult to wade through the right side of the pit but Bjorn Thorsen took the lead for the Varsity boys. Dylan Cook now in 2nd was followed by Sebastian Vaisset-Fauvel, Ethan Gaigalas, and Jake Heinlein in a tight cluster. Stanley Yang and Sam Benabou were stuck behind a wall of runners but tried to break through. As they came through the finish line no one had any idea how the overall result would turn out. Bjorn ended up in 6th overall, Dylan in 13th, Sebastian in 20th, Ethan in 27th, Jake in 49th, Stanley in 95th and Sam in 103rd. Because none of the runners wore their uniform for this race (too muddy) there wasn’t any way to know each team’s final points in the race. The varsity boys were glad they all finished this challenging course but they weren’t too happy with their times. This was not surprising given the difficulty of the mud and river crossings. Before the races Coach Castro had instructed the team not to play in the mud during the race (just to race through it) so when the race was over he rewarded that athletes with play time in the mud. It’s not every day you find a mud pit that’s 15 feet wide and 40 feet in length. Unfortunately, the team did not have a chance to wash up at the river before the awards ceremony. So off they went to the podium in all their muddy glory. Not thinking that the Varsity boys would get an award they raced to the river to rinse off after the individual awards were given. 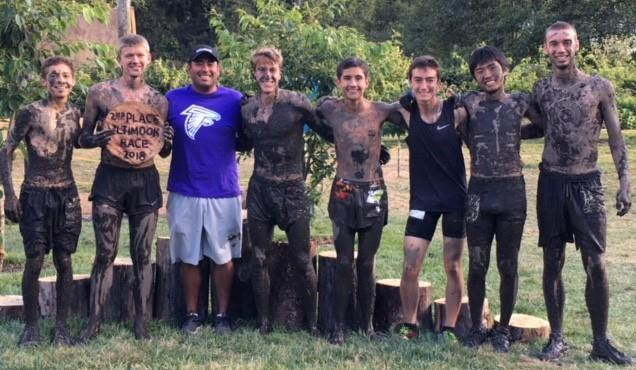 As they made their way to the river the loud speaker called out “and 2nd place goes to College Park!” So the seven super muddy runners came charging back to the stage to receive their trophy. They beat out 20 teams! So with 8 chaperones on this trip, two of the dads decided to try out the course for themselves. They ran in the open race which was the first race of the day. The race bell rung at 8:15am! Donovan Heinlein and Hale Sramek both held on to the tail end of the lead group through the mud pit and river crossings. “The mud and water from the two river crossing were debilitating.” Donovan surged with a mile left to come in 18th overall and Hale hung on to place 29th overall.